Ted seen next to his painting of Dino DeNaples on a local skatepark mural. 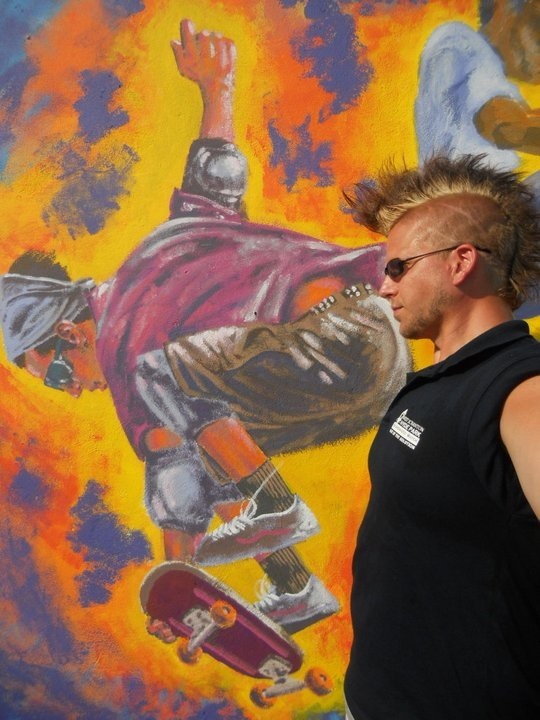 Ted Michałowski is a Polish illustrator/educator from West Side, where he painted the Lords of Drawtown mural at Jackson Street Skatepark, with 22 of his students assisting, portraying 19 local skaters, including a few of the WRITING ON THE WALL storyslammers, and one police dog. Michałowski recently drew an on-the-spot Drawcore mural during Community Skate Day at the Everhart Museum, to accompany the current skate exhibition. For the NEIU, Ted teaches in the EverArt program for middle-schoolers monthly in the Everhart, and is artist in residence in various Alternative Education for Disruptive Youth schools. Currently Ted is painting two murals of local jazz musicians outside Carl Von Luger Steak & Seafood, and is planning future large murals with two of the area’s largest venues for sports and recreation. He always admired and appreciated the dexterity and determination of skaters, finding connection and influence in drawing. Ted also was a storyteller at both the Dirty Laundry StorySlam and the West Side Stories StorySlam. Check out Ted’s story at the West Side Stories slam.